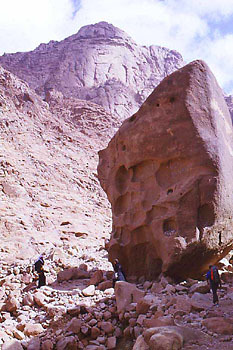 Sinai, troubled land of wars and Old Testament migrations, is blessed in its mountainous south with a legendary bush that once burned and superb granite climbing. In the midst of this playground, or place of pilgrimage, depending on your chosen devotion, is the ancient village of St. Catherine. It provides an accessible centre from which to explore the barren land of the nomadic Jebeliya Bedouin. Our attention focused on the towering rocky peaks of Jebel Safsafa and Jebel A Dir that form a spectacular backdrop to an arid landscape cut by subtly coloured wadis. Dr Gasser, or ‘Gazza’, manages the local Bedouin health project in the St Catherine’s Environmental Protectorate. He proved to be an excellent contact, not only in finding climbing locations, but in showing us some of the medicinal and salty plants that have helped the Bedouin survive this harsh environment for centuries. Everything he knew about climbing, which wasn’t a great deal, had been passed on some time ago by visiting Hungarian climbers. Climbing with him had its comic moments like when one of his trainers flew off mid-pitch, slithering and bouncing its way to the ground. Undeterred and keen to continue he first had to be lowered off and reunited with his footwear, surprisingly unwilling to continue in his socks. Then on nearing the summit, disappointed that we had no plans to abseil, Gazza suddenly conveyed the urge to untie and scramble higher to look for a good way off. Even highly intelligent beings can be ridiculous at times; soloing E3 in trainers would have been quite a challenge had we not been able to discourage him. Our goal was to climb a steep 250m wall on Jebel Safsafa, this time without the doctor. As we walked out of town, the road workmen momentarily stopped their deafening drills to wave, having grown used to our packs, bouldering mats and smiles. Starting at 8am we raced up four direct slab pitches, wonderful smeary climbing with quartz crystals that crunched underfoot. By 10am we were sat under a beautiful overhanging orangey-red wind-sculpted face. The first of the steep pitches led past a beehive-like mound of crumbly rock, unsettlingly perched on the hand traverse between me and the belay. It appeared to be staying in place purely by virtue of its flat base. I eyed it with suspicion hoping that it wasn’t going to crush a finger or collapse onto me at the slightest touch. 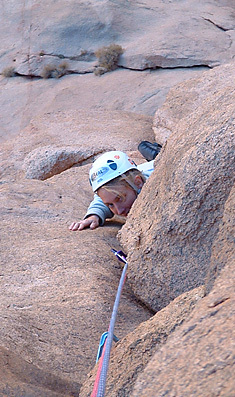 John shouted encouragement from what looked like optimistic belay placements in an exfoliating crack. ‘The rock’s better underneath than it looks.’ Sure enough, once the mound had been circumnavigated the rock a fist-width beneath surface was much more reliable and the belay looked quite good. As I looked down into the valley six more coaches arrived, packed with tourist pilgrims drawn to the Monastery of St Catherine where they would squeeze their way in turn along its narrow passageways. Among the monastery treasures is a library of ancient manuscripts and icons comparable almost to that of the Vatican, and a 6th century church reputed to lie directly on the site of Moses’ burning bush. It has, allegedly, has been growing ever since the Exodus and can still be seen today. With America just about to declare war on Iraq another Bush became a hot topic with locals keen to know what the English thought. From here though, the hubbub of events below somehow seemed insignificant, especially since the incessant cries of ‘taxi’, ‘camel’ and ‘where you from?’ were no longer audible. Above looked demanding and perhaps impossible without a siege. The choice: insecure barn-dooring with little gear, or a strenuous fingertip crack to surmount a bulge. Opting for the former, we hoped the difficulties would be short-lived. Part way up John began to look uncharacteristically unstable. ‘You can always come down you know’, I yelled, only to be met with a withering look from above. How could I have been so stupid? A few minutes later, after a fruitless foray and nervous retreat, the crack seemed the best choice after all. Its technical and pumpy lower section succumbed to headpointing and led to an easier-angled continuation. I shuffled up inelegantly, Egyptioning (or ‘Sinaiing’) against the heavily talc-veiled sidewall to emerge with a differently coloured top at the belay. Higher lay red, wind-sculpted rock offering a selection of charismatic features, including a giant folded ear which was huge fun to crawl beneath. An assortment of Hueco Tanks-style holes appeared, requiring lateral thinking to worm between them. Eventually the angle eased and the adventure of surfing through our ocean of petrified waves came to an end. Two hours of scrambling and two abseils in the gloom finally deposited us once again at ground level at the close of a very tiring day. After a day or two of excellent bouldering the two of us, plus an English journalist who spoke fluent Arabic, headed off with Dr Gasser to stay with Bedouins at the remote Echo Lodge. 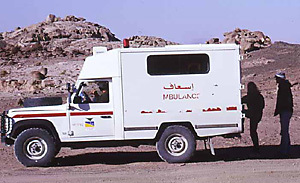 Whisked along by off-road ambulance to a high mountain plateau, we explored valleys with 300m unclimbed walls above Wadi I’tlah and Wadi Tala’hey and vowed to return. I watched with fascination as the local Bedouin elder gave animated accounts of snake and scorpion vaccines, and plants useful for men with young wives, wondering how they might work. His family had been settled in the area for hundreds of years and now in his fifties he had clearly prospered, having nine children and several camels. More than a hundred 2-8 pitch routes have been recorded in the area, the majority climbed in the 1970s and mostly in the VS-E3 range. On our visit we also climbed the neighbouring Jebel A Dir by an easier new route - named Dr Gazza’s Camel - that followed curious dykes up immaculate slabby granite. In addition there is a mass of bouldering, all of it, as far as we could tell, previously unrecorded (see www.thefreeclimber.com for a topo of some areas). 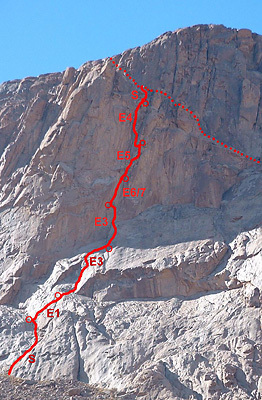 Summary: An account of a new route, Holey Moses, E6/7 6b, 250m, climbed by John and Anne Arran on the North-West face of Jebel Safsafa, Sinai, Egypt. We accessed the area by plane to Sharm-el-Sheikh and then travel is possible via taxi or local bus to St Catherine via Dahab, taking half to a full day. It is also possible to take a holiday company day tour to St Catherine and arrange to stay there. This article, by Anne Arran, appeared in the 2003 Alpine Journal.